Come For The Academics, Stay Because You’re Family. Fostering Success Through A Balanced Education. Curriculum may be defined as “all the guided experiences of the child under the direction of the school.” It includes the content of courses of study and also embraces the development of the whole child that is within the scope of the school. In keeping with our school philosophy and objectives, we enable the students of Notre Dame Academy to grow in knowledge and love of God, and of themselves. Religious education is experienced throughout the school day. The school has its own unique characteristics – an environment permeated with the Gospel spirit of love and freedom. The faith formation of a student is an ongoing process. Ideas about God and His world are incorporated into daily classroom activities as the opportunities present themselves. The curriculum is designed with the rigor, meeting the needs of all learners. Instruction in academic areas follows both the directives from the Common Core Framework, California State Frameworks, as well as the Course Objectives from the Diocese of San Diego. At NDA we offer small class sizes. At the preschool level we structure our classroom with no more than 24 students per class. The expected average teacher to student ratio at the preschool level is 12:1. This allows for individualized care, creating a strong foundation for the students to build on in their future educational career. Introduction to print awareness, and understand that print carries specific meaning. Comprehension of age-appropriate text read aloud. Develop child’s characteristics and abilities in a positive environment. Learn to demonstrate abilities and assert preferences and desires. Learn cooperation with social expectations, group rules and roles. Learn to follow simple rules and routines and manage classroom transitions. Learning centers provide opportunities to interact and communicate with teachers and peers. Participates in cooperative play during indoor and outdoor activities. Learn to communicate own needs and desires to peers and adults. Kids Don’t Just Grow Up, They Grow Within. At NDA we offer small class sizes, no more than 25 students per class. We have one classroom per grade in Kindergarten through 4th grade. We find that our class sizes are the optimal size. They are small enough for individualized and differentiated instruction, yet large enough for positive social and peer-relationship development. Our students grow with their peers and develop friendships that last a lifetime. At the elementary level, students enhance their personal relationship with God through extensive scripture study, role playing, problem solving sessions, and prayer. Special preparation for First Reconciliation and First Holy Communion is given at the second-grade level. The Notre Dame Academy language arts curriculum is built upon a Balanced Literacy approach and four interrelated strands in language development: reading, writing, speaking, and listening. Through a sound, sequential program, students are provided experiences which make reading a pleasurable discovery experience. The Notre Dame Academy math program blends discovery and discussion, projects, explorations, and investigations into a curriculum that recognizes and augments the children’s capabilities. The curriculum builds on the fundamental mathematical strands of numeration and counting, operations and relations, and problem-solving. It is achieved by integrating mathematics instruction into multiple curricula areas, with emphasis on application in science and STEAM, the origins and uses of the language of mathematics, and its close relationship with visual perception. Through the curriculum, the students gain a familiarity with math vocabulary while solidifying their computation skills. The program also aims to build self-confidence in mathematical abilities and to teach organizational skills to the students as demonstrated by their work. Science class at Notre Dame Academy provides students with a working knowledge of scientific concepts, experienced based methodologies, such as group discussion, lecture, and hands-on use of manipulatives, lab experiences, field trips, and science fair projects. Scientific knowledge advances when students observe objects and events, think about how they relate to what is known, test their ideas in logical ways, and generate explanations that integrate the new information into understanding of the natural and designed worlds. Thus, science at NDA is includes content knowledge and science practices. Our students experience and interact with science not only in their regular science class, but also in their STEAM class. STEAM class is the integration of Science, Technology, Engineering, Art, and Mathematics. It is taught in grades Preschool through eighth grade. The STEAM or STEM philosophy is paradigm shift and focuses on valuing the learning and design process. In essence, we dare our students to be wrong, to try multiple ideas, listen to alternate opinions and create a knowledge base that is applicable to real life. The Notre Dame Academy social sciences curriculum is a sequential program, which emphasizes responsible membership in communities, nations, and the world. The curriculum is enriched through the integration of geography, current events, and citizenship training. The entire social sciences program is a content-intensive, inquiry-driven, and literacy-focused. A major goal of the social sciences program is to develop caring, literate citizens as students grow into their roles of decision-makers in our democracy and in our world. Following the new History-Social Science Framework for California, our teachers design, implement, and maintain a coherent course of study to teach content, develop inquiry-based critical thinking skills, improve reading comprehension and expository writing ability, and promote an engaged and knowledgeable citizenry in history. 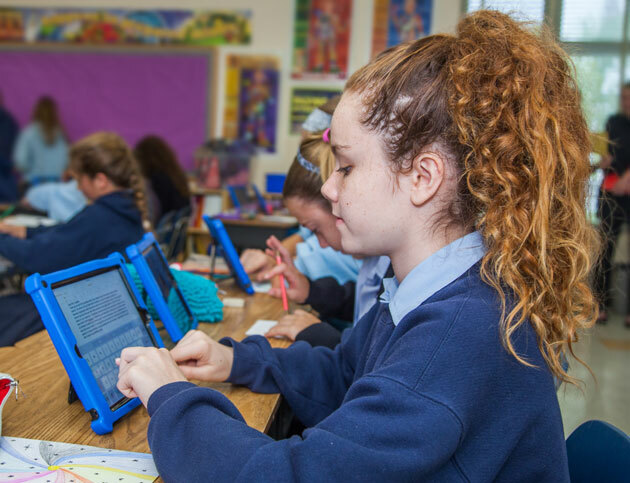 At Notre Dame Academy, technology is used throughout the day at each grade level, both in the classroom and during students’ Technology class times. Digital citizenship and responsible technology use is an integral part our Technology class at NDA. One-to-one iPads in our Kindergarten through eighth grade classrooms provides our students with opportunities to collaborate and communicate in authentic learning activities that relevant to the world in real time, and media literacy. Whether it's explicit instruction on word processing and typing skills or multi-media presentations on cross-curricular projects, our students are prepared for the 21st Century world. Through the use of a sequential art program, students are introduced to the masters of art, media of art, and hands-on art activities. The program emphasizes art as a process for communicating ideas and includes Visual Arts Heritage through major artists. To be most effective, students learn concepts and skills that facilitate individual expression in various arts and music. Skill building is presented through experimentation with a variety of techniques and materials. Learning to observe and listen carefully is the key to successfully communicating an idea through drawing, painting, and music. Concepts and skills are presented in a developmentally appropriate way. 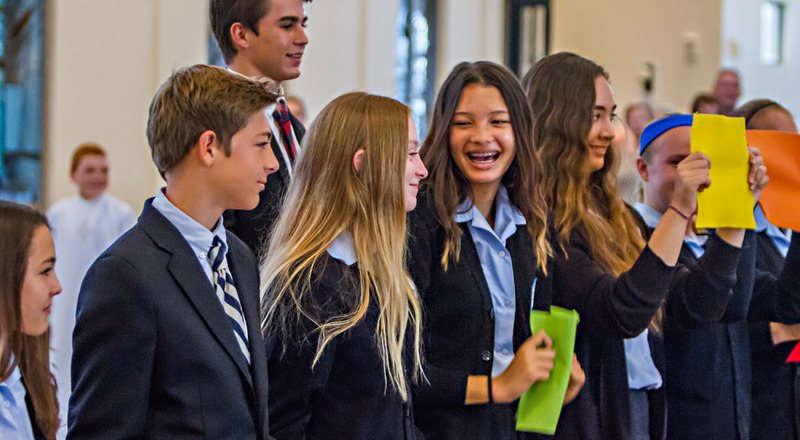 At Notre Dame Academy, students in all grade levels are given tools to develop and strengthen organizational and study skills in order to enable them to succeed to the best of their ability. By teaching metacognition skills and strategies our students become more self-aware and reflective learners. French and Spanish are taught in Preschool through eighth grade. The goal of the program is to increase the awareness of each child to the importance of learning a foreign language and culture. Cultural, linguistic, and effective strands of learning are incorporated. The children encounter a rich, interactive environment where language acquisition skills are balanced with cultural celebrations and traditions. The program also aims to build self-confidence in verbal skills in a foreign language, and to teach students organizational skills as demonstrated by their work. 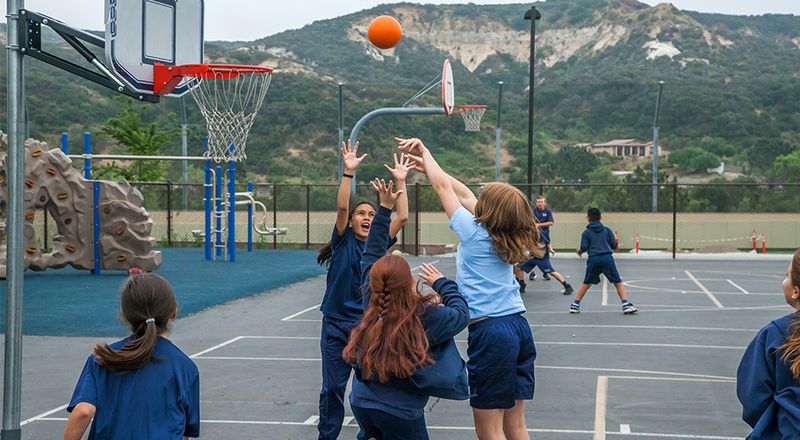 The physical education curriculum and athletic programs are designed to meet the interests and abilities of the students at each grade level. The curriculum emphasizes the development of greater physical control and motor efficiency that will be useful in lifelong, everyday activities. Helping children to develop a positive self-image and good sportsmanship is an integral part of the program. Through a wide variety of activities and team sports, students develop a positive attitude toward physical activity and are encouraged to integrate this into their everyday lives. NDA's Trinity, which is composed of the Schoolwide Learning Expectations, character development program, and social skills curriculum, supports the students as they grow habits of mind and heart, as well as their growth in academic achievement. Since we leave nothing up to chance at NDA, our students are taught and practice the social skills necessary to become successful, active members of the community. Whole-Child Education That Propels As Well As It Prepares. Preparation for high school and beyond is our main academic focus in our middle school classrooms. 99% of our students are accepted into their top choice high school. Our teachers collaborate with the local Catholic High schools to ensure our students are ready for the challenges of competitive college-prep high schools, both academically and socially. Our graduates of today are the leaders of tomorrow. Religion in Middle School involves problem solving, liturgy planning, and community and parish involvement. It includes church history and scripture study. This is accomplished through teacher-led discussions, Bible stories, plays, and shared prayer time. The curriculum has been designed to take the students through a logical progression where skills and concepts are introduced, reinforced, and mastered. By the end of Grade 8, students will be able to write an intelligent, mechanically-sound essay and research paper; read and discuss literature with insight and perception; understand the underlying structure of the English language; deliver a formal speech; and effectively participate in a discussion. 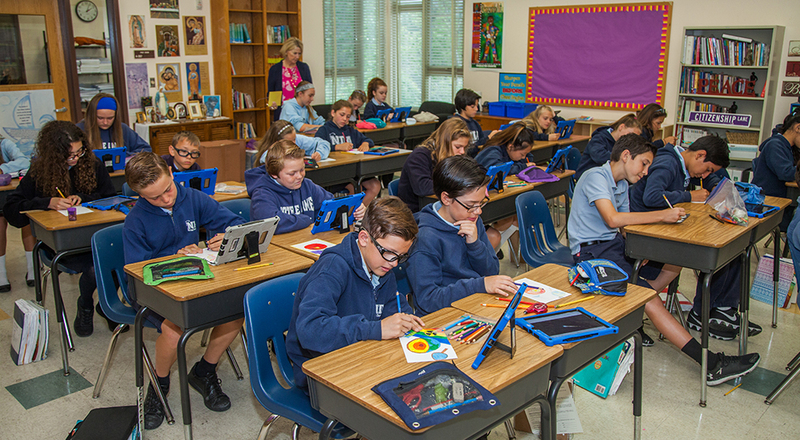 During the Fall of 2013, Notre Dame Academy conducted a rollout of Apple iPads for the Kindergarten through Eighth grades. Allowing students to utilize technology during the educational process is a means for enhancing each student’s overall learning experience. Our goal is to provide a safe, appropriate, and effective learning environment for all at Notre Dame Academy. To find out about our policies, codes of conduct, requirements for cases in Middle School, and incident reporting, please view the below-listed files. The educational mission of the Church and the reasonable expectations of parents require that a Catholic school be distinguished by an atmosphere and formal program which relates religious beliefs and practices with the moral development and education of children. Regular religious instruction is an integral part of the educational program for all students at all grade levels. Daily assembly of the student body which includes community prayer, flag salute, and announcements. When Mass is not available at school on a Holy Day of Obligation, parents are responsible to assure attendance at Mass at St. Therese of Carmel parish church, or another Catholic church. All incoming students must present a copy of their Baptismal Certificate at registration time. At Notre Dame Academy, First Reconciliation and First Eucharist are celebrated as a parish community. Sacramental preparation for children is the primary responsibility of the parents. During the year when students (usually in Grade 2) receive the Sacrament of Reconciliation and the Sacrament of Eucharist, parents must attend classes to help prepare their children. At Notre Dame Academy, in addition to instruction received from parents, preparation for sacraments becomes a part of the ongoing religious education program in the classroom. Additional sacramental instruction will be offered for any student in grades 3-8 who has not made their First Communion and/or Reconciliation. 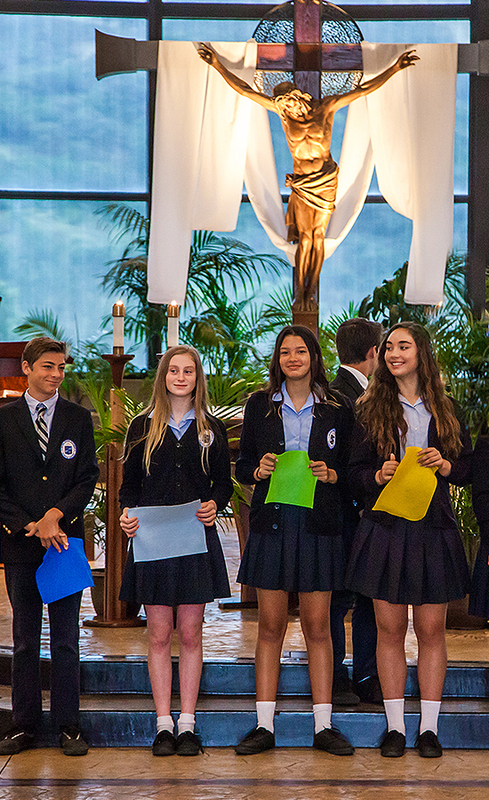 The Sacrament of Confirmation, in accordance with Diocesan Policy, is reserved for reception by students who complete a preparation program while in high school. On a weekly basis and Holy Days of Obligation, students will attend Mass. Parents, friends, relatives, and families are encouraged to join them. Full participation is expected in word and song. Students are required to be in formal uniform at these Masses. In addition, students are encouraged to participate in Reconciliation Services offered by the Parish.